Although nothing is carved in granite, funerals usually are played by a solo piper. Some clients have requested a piper and drummer and the end result was quite pleasing. Regardless, it is important to provide as much notice as possible prior to the date and time of the service. If possible, please contact me before final arrangements are made in case of conflict. If a military detail is to be present, please view the MILITARY webpage of this site. Piping can occur almost anytime during the church service and/or at graveside. Your denomination may have restrictions, so consult your clergy. Funeral homes almost always have their own on-site chapel, and they will have no objections to bagpipes being played there. The most requested time during a church or chapel service is at the Recessional. The piper takes the lead position in front of the mourners, playing as he exits the facility and continues to play until the deceased is placed into the hearse. It is considered good etiquette for the piper to remain concealed until needed during the service. This ensures a memorable effect for those attending and his presence does not distract from the service. I make it a point to arrive early enough to meet family members and assure that I will be performing as asked. Again, there are no set protocols. I have piped the casket into the church and piped during mid-service. At smaller churches, I've remained just outside to keep the pipes' volume level comfortable. In the Memphis and MidSouth, piping usually takes place at graveside and this can be as many as three occasions. Any more at graveside and it tends to detract from whom the service is actually intended. 1) As the casket is carried to graveside by the pallbearers. 2) Upon completion of the minister's words or his final prayer (typically Amazing Grace at this time). 3) And at the Dismissal, from an appropriate distance the piper plays a selection, something slightly more upbeat musical selection. I always make certain to arrive at the cemetery ahead of the funeral entourage so tuning and site inspection can be performed. My post is usually a short distance from the gravesite area and remaining in view of the family seated under the canopy. A pre-arranged cue from a funeral director signals me to begin playing. The most requested tune at funerals is Amazing Grace. As said above, it's typically piped after the minister has finished. My modus operandi is to perform it with three verses. Upon reaching the 3rd verse, I turn around and walk away, while remaining in sight of the family. This creates a fading effect that is quite touching. Many associate religious symbolism with it. Some families ask that I play anything but Amazing Grace, so it certainly is not required. A client once asked me to do the opposite of the previous paragraph. She requested that I begin piping Amazing Grace at a distance from the graveside and walk towards it. She asked that I conclude upon reaching the grave. It too makes for a lovely effect. Traditionally, bagpipes are thought to contain near-mystical powers. Supposedly the pipes are the only instrument that can be heard in Heaven. 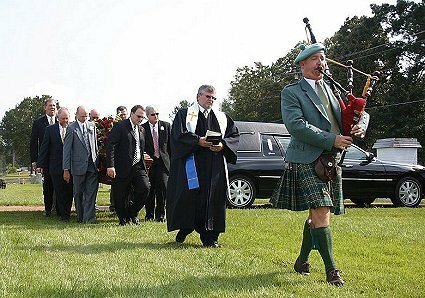 As a result, a piper playing bagpipes helps to speedily direct the departed souls towards Heaven's Gates. The walking away symbolizes the piper leading the departed to the Hereafter, yet stopping short of the Gate through which he cannot pass. 1. Inform your family that a piper will be present. 2. Also, include the above information into the burial pre-arrangements. The funeral director, as the advocate, will notify me and remove the burden of the initial contact. 3. In the rare event that I cannot be secured for the funeral, there are other ways the memory of a loved one can be honored. It is standard practice in many churches that people are allowed to place flowers in memory of deceased family and friends. I have been asked by families to play during a regular worship service. Most churches would welcome the opportunity and with a prior announcement, and it will be received by a host of appreciative listeners. - There are countless tunes written specifically for bagpipes for any occasion. Bagpipes have a narrow range of nine notes without accidentals and an odd, ancient scale. I possess a collection of over 250 hymns transcribed for the great highland bagpipes. Should you desire a specific hymn, I probably can perform it. - Outside piping becomes more challenging when temperatures are in the 40s and colder, or upper 80s and warmer. - If you personally contacted me, it is especially courteous to inform the funeral director that a piper will be present. - Funerals usually have little notice and it's not unusual for me to have two, or even three scheduled during the same day. Please provide as much advance notice as possible, and preferably before final plans are made so that details can be worked out with you. Our weather certainly can be extreme. Memphis can be scorching hot in July or bitterly cold in January. Often the temperature is comfortable, yet the rain seems to have no plans to ever cease. I have performed at graveside when the air temperature passed 100 degrees Fahrenheit. And I've piped at wintry services with freezing temperatures as low as 11 degrees. Please do not deny yourself my services at a loved one's funeral because of extreme weather and concern for my well being. I have the accumulated expertise, seasonal gear, and years of experience to make certain I am prepared to perform as required.